What Would Dave Ramsey Do? Rachel and I have the privilege of hosting Dave Ramsey’s Financial Peace University at church, starting next week. If you are familiar with Dave Ramsey, you know he’s been on a mission to get America financially fit for two decades, a quest he began after filing for personal bankruptcy and learning a great deal in the process. That’s just old-fashioned and ridiculous. You can’t run your business without debt, much less your life. How do you ever grow, or get the stuff you want? I can’t believe the impact this wisdom has had on my life and my business. I wish I would have adopted the mindset earlier! 3. One’s mindset changes when holding cash. Personally, I have been tempted to buy things with borrowed money (for fun or business) that I wouldn’t have forked over the cold, hard cash for if it had been in my possession. 5. There are some folks out there who have made a great deal of money without using debt, including Dave Ramsey himself. Apple, Bed Bath and Beyond, to name a few, also operate without debt. 6. And there are a lot of finance professors with incredible understanding of financial leverage who are broke. What does this mean for a small business or farm? Everything. You can’t go bankrupt if you don’t owe money. You can’t be forced to sell anything, and you don’t have to send your financial statements to the bank so they can tell you if you’ve violated a loan covenant. Just like Dave, I’ve had the privilege of trying both strategies. And just like Dave, I promise that life is more peaceful with a deep respect for Proverbs 22:7. I once walked into a winery in Napa Valley, on a mission to do some research for a consulting job. I walked out with the research, PLUS a nice bottle of wine that I hadn’t planned on buying, but was thrilled to show my wife. Why? Because the man knew how to sell. A great salesperson understands that there are 4 distinctive steps to selling anything. 1. Qualification: Does the prospect (potential customer) have the need for, AND means to purchase, what you’re selling? If not, you have no business selling them anything. That was the rule Mr. Hot Sauce broke; hot sauce is a terrible pairing with wine, and thus I wasn’t a qualified customer. 2. Rapport: People buy what they need and want from those they KNOW, LIKE, and TRUST. This means you have to take the necessary time to build rapport through honesty and conversation. Also get a chance to know the customer by asking questions, and to determine if your products really do fill a need. And note that rapport evaporates; if you sold a man a butchered steer last year, you may need to rebuild some rapport 12 months later, before selling him another one. 3. Education: Once the prospect trusts you (but not before!) you can begin offering him or her information about your product. At a farmer’s market, this means you start by chatting with a customer, and THEN tell them about your products. Normally, a customer will indicate that he or she is ready for the “education” by asking questions. 4. Close: The final, most dreaded step, is the close. But it shouldn’t be dreaded. If you did steps 1-3, the close comes automatically. If it doesn’t come automatically, or with a friendly nudge (ex. “would you like me to ship that for you?”) refer back to the beginning. BONUS: When we added pastured meat to our offerings at Six Sigma Ranch, it at first surprised me how easy it was to sell. But it shouldn’t have. Most of our existing wine customers also enjoy quality meat, and they had already completed steps 1 and 2. As soon as they learned that we sold meat, they asked for brief “education” on the product, and closed the deal with limited fanfare. I learned that adding quality, complimentary products can quickly fill more needs for your existing customers. Joel Thinks You Can Farm . . . . . Do You? One of the biggest mistakes I’ve done in my own life is what can be called “failure to launch.” Getting a good idea and then letting it sit until the fire has gone out; what a waste. Joel encourages or demands that we start immediately. This seems to be true no matter your dream. If you really want to farm, you need to start in your own backyard. You need to make something that you love to eat and grow. So, note to self: Work on your dream today. Don’t wait for huge amounts of capital. Understand the difference between wants and needs. Start small, rent, borrow, beg, and Go for it. Oh, and read Joel’s book: “You Can Farm” (Amazon). Pick Your Battles, Farmer Brown. There is no saying, as far as I know, that goes “thriving like a pig in an oak woodland.” But there should be. Watching the Berkshire hogs at Six Sigma Ranch shovel the black topsoil in the woods with their noses in search of acorns is a joy. They’re even happier than the cows in the pastures, and certainly happier than the neighbor’s cows. Since I am curious by nature, I wondered why. Likewise, the grapes thrive. There’s no place in the world better for growing grapes than Lake County (although our friends from Napa Valley, with whom Lake County shares a border, might argue for a tied game.) The small beehive buzzes with enthusiasm. But the apple tree by an old homestead near the tasting room only survives, and makes decent apples most years, but they’re not world-class. This made me think. What do pigs, grapes and bees all have in common, that apples and cattle don’t? They were here when we got here! 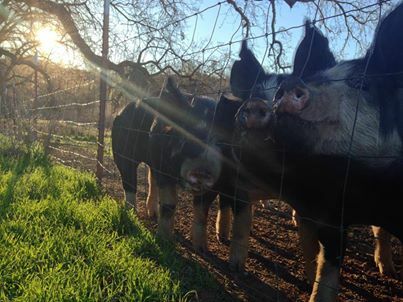 Lake County is home to wild pigs, wild grapes and wild bees. And those all do great when we plant them on purpose. But there are no wild apple trees or bovines here. This seems obvious now, but I never thought about it as a rule for farming before: When faced with a new plot of land, what should you plant? Start with what’s already there! Trying to make a living growing apples in our Mediterranean climate? That would be a waste of time. On that note, Lake County is full of wild turkeys and quail. So you might see some pastured poultry with a Six Sigma logo on it in the future. And the blackberries invading the sheep pasture suggest that jam would be a good idea. It sounds like we will have plenty of options for Farm-to-Table dinners in the next few years.